Silent Hunter is a World War II submarine combat simulation for MS-DOS, developed by Aeon Electronic Entertainment and published by Strategic Simulations in 1996. The game takes place in the Pacific War during World War II, the player commanding a submarine of United States Navy. Most contemporary US submarines and Japanese warships are featured along with some generic merchants. 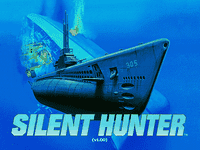 Silent Hunter has received high appraisal from subsim aficionados and is considered to be the best Pacific War subsim of its time. A single encounter generator is available, but the standard mode of play is the career mode, where the player must take their boat to patrol far behind enemy lines with the mission to search for and destroy any enemy shipping. For best success, the player should concentrate their search on shipping lanes, which may be deduced from contact reports. The boat is actually commanded by crewing various stations in first person (no crew is visible, even though their voices are heard), which is usual in the genre. The game models many characteristics of World War II-era submarine warfare, such as the faulty Mark 14 torpedo and anti-submarine warfare tactics used by Imperial Japanese Navy. However, wolf pack tactics are not available, even though US Navy did use them to some extent. SVGA mode is used, but the graphics are in 2D, which was old-fashioned by the time of the release. However, the game (rather exceptionally) models spherical Earth by having visibility be limited by the horizon. The game was re-released in 1997 under the title Silent Hunter: Commander's Edition, which had the original release with all official patches applied, some additional patrol zones and a scenario editor.